Fellow Wisconsinites, Greetings Again to You All! We have already introduced Terry Larson, 2018 Candidate for WI State Attorney General, and Andrew Zuelke, 2018 Candidate for WI State Treasurer. Today, we wish to highlight our candidate for Wisconsin State Assembly, District 64 – Mr. Thomas Harland. As with all of our email communications with you, we not only invite, but also strongly urge you to share these messages with all of your friends, family, acquaintances, or others who share our political convictions, or who otherwise share a genuine and open willingness to hear and consider the political views of others. Encourage them to join our email list! This post was delivered to our email subscribers on Wednesday, September 12. Click here to be added to our email subscription list, and to receive our Communiqués when they are hot off the press! 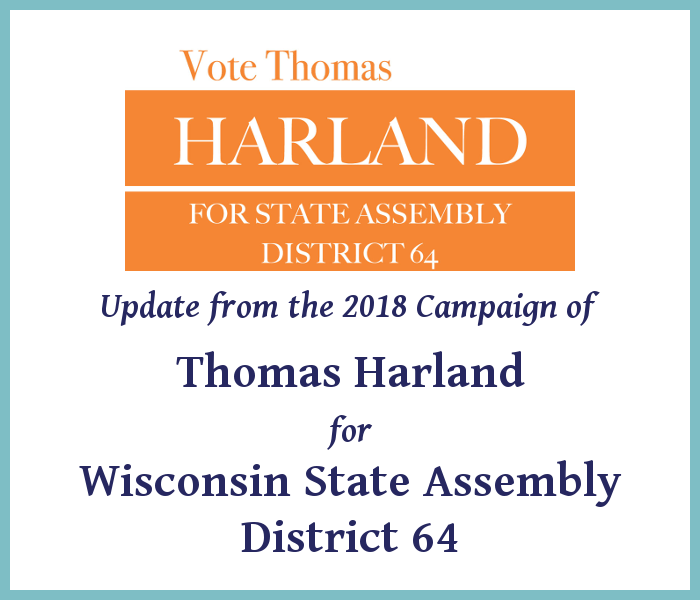 Thomas Harland is running for Wisconsin State Assembly in the 64th District. He is facing career politician, Democrat Peter Barca, who has not had a challenger on the ballot since 2010. 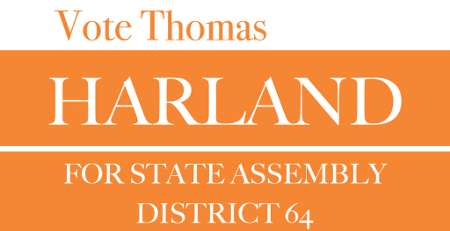 The sole conservative on the ballot in District 64 , Mr. Harland will provide a conservative option that has been long-awaited by the people of District 64. He champions limited government and free market principles, supports ending the State Lottery, encourages the sale of state owned assets to pay down debt, and promotes traditional family values. 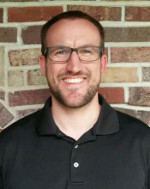 Mr. Harland is a native Wisconsinite and graduate of Carroll University with a degree in Business and Economics. Limited Government: Government has become too large and too entangled in our daily lives and “being a politician” has become a career. Wisconsin is 1 of only 10 states with a full-time legislature, and could save over $5 million annually in salaries by moving to a part-time structure. Hundreds of thousands of dollars paid in Per Diems could be eliminated by using technology such as web conferencing to perform meetings. Transportation: Wisconsin needs a reliable infrastructure to ensure people and goods are transported quickly and safely around the state. Wisconsin should privatize the hundreds of miles of old Milwaukee Road rail tracks it currently owns. I will work to re-route the Amtrak Empire Builder route to pass through Madison on its way from Chicago to the Twin Cities. Environmental Stewardship: It is our responsibility to be prudent, productive, and efficient stewards of God’s natural resources. We should balance protecting the environment and our right to private property. Defending the Unborn: Over 1,800 abortions are performed daily in America. This needs to stop immediately. The only “choice” that is being made, is the choice to murder a defenseless child. I will work to defend the defenseless in all circumstances. Foxconn & Free Markets: The government should not decide the winners and losers in the economy. The government is responsible for creating a positive environment for business, not giving a specific company a pass on taxes and environmental regulations just to “bring jobs” to an area of the country that is already above full employment. Education: I affirm the free market principles which drive improvement of education through non-traditional options such as internet-based schools, charter schools, Christian and private schools, as well as home-schooling options. “Common Core” has failed Wisconsin. We need to instill a “competition breeds excellence” mindset for both our teachers and our children. Gambling: With the recent SCOTUS decision on sports betting, I believe that Wisconsin should give local governments the final say on the issue. I also believe that the government should not promote gambling because it exploits those with gambling addictions. I will work to end the Wisconsin Lottery that taxes the poor to benefit the middle and upper classes through property tax relief. Energy: Free market principles can also be applied to Wisconsin’s energy market through deregulation of the gas and electricity markets. Deregulated energy markets mean more choices for consumers. Retail Energy Providers (REPs) will compete with one another to drive down energy prices and implement greener technology such as solar or wind. Where is WI State Assembly District 64? 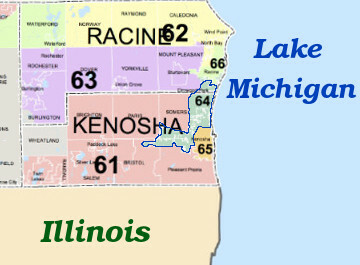 District 64 is in extreme southestern Wisconsin. Unless otherwise noted, the contents of this message are licensed by its author and the Constitution Party of Wisconsin under a Creative Commons Attribution-NonCommercial-NoDerivatives 4.0 International License. 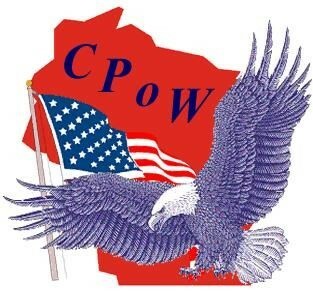 The “Featured Image” at the head of this blog post, the “District 64” image toward the end of this post, and all CPoW Images: Copyright ©2018, Constitution Party of Wisconsin, All rights reserved. All other Images in this Post: Copyright ©2018, Thomas Harland, All rights reserved. Used with permission.